Learn the Pica9 mission and why the company is laser-focused on giving marketers exactly the tools they need to achieve a whole new level of efficiency and accountability. Interviewed for a report on the fastest-growing digital marketing companies, Pica9 founder Kevin Groome explains the company’s commitment to deliver the best marketing software possible for major enterprises. Today more than ever, branding makes a huge difference at every customer touchpoint. Delivering the world-class customer experience that consumers expect from their favorite brands – all the way down to the local level – is what Pica9 is all about. 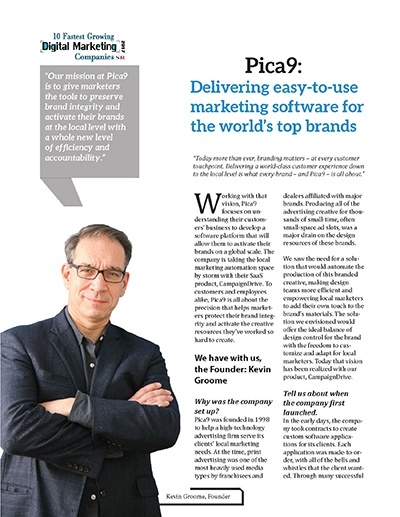 In this interview with The Silicon Review, Pica9 founder Kevin Groome explains why the company’s mission has always been to give marketers the tools to achieve a whole new level of efficiency and accountability with their brands. You’ll discover why preserving brand integrity and activating brand marketing are the cornerstones on which the company is built, and what that means for customers. Fill in the fields below to read the full interview.